Political Podcast Review: So many podcasts, so little time. 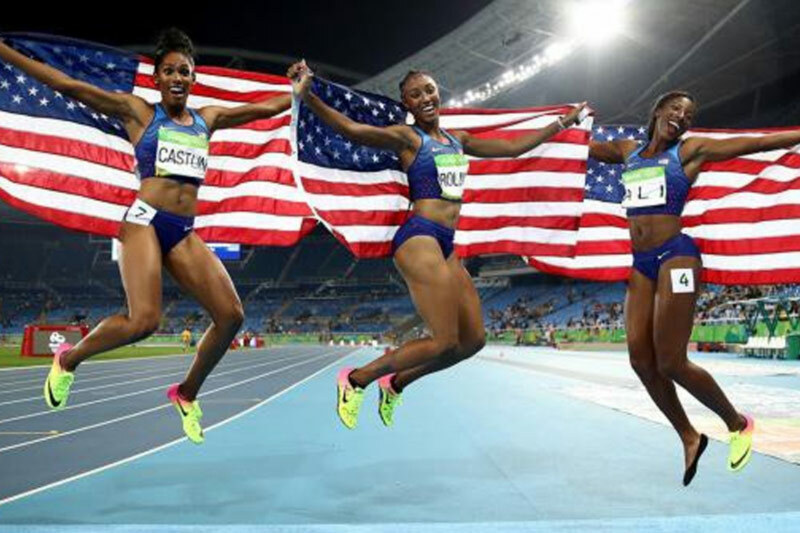 In case you didn’t have time to catch it: The US women swept medals in the 100m hurdles. Thanks to our handy guide, you won’t miss this week’s political podcast highlights. Our ultimate guide to picking a weekend podcast that fits your every unique need. Who has time to watch 5 hours a day of prime time tape delayed Olympics coverage, keep up with Donald Trump’s endless series of pivots AND listen to the fantastic array of political podcasts available daily? No one, that’s who. No one. If you wish you could go to Political Campaign Strategy School then listen to Keepin’ it 1600. A favorite of the Javelina team, former Obama staffers Dan Pfeiffer and Jon Favreau review the weeks’ events through a lens of political operatives. They give you the thinking behind the seemingly ridiculous actions of the Presidential candidates and often strategize how they would advise said candidates to move out of this week’s self-made scandals. This week’s guest, Atlantic Senior Editor Alex Wagner, helps to frame the discussion about America’s radical right, and the three deep dive on how we have reached this point. How, in our modern age of rapid communication and transparency, has extreme conservatism taken hold in this way? What are we repeating, and what could we be missing? It’s fascinating conversation, and yet always framed with light-hearted accents so you somehow find the will to live after the podcast ends. Four and a half stars. If you like to catch the headlines and then switch to the Comedy Channel listen to NPR Politics Podcast. The folks at NPR may not have spent a lot of creative energy on coming up with the name of this pod but they are truly fulfilling the mission — talking to their audience like they talk to each other. A rotating gang of mid-30s hosts keep this pod fresh and entertaining — and is targeting the younger demographic far more effectively than their regular radio programming does. If this podcast were a meal it would be an entrée of recent event news reporting, with a side serving of analysis and a garnish of banter and inside jokes. Twice-a-week episodes do an overview of the week’s biggest news stories and a closer look at topics that might catch your interest. A recent episode on the role of food on political campaigns showed that they at least share our priorities. The realization that candidates should basically never eat in front of anyone radically decreased the chance of any of us becoming candidates one day. If you think the media isn’t covering Trump enough, then listen to Slate’s Trumpcast. If you find yourself fascinated by the Republican Party’s Presidential nominee and feel the need to learn more about the @RealDonaldTrump, this is a perfect podcast for you. If you can hack adding more Trump to your life, you’ll learn a lot. Each episode serves as a magnifying glass into the former reality star’s background, character, as well as recent things he’s done or said, and what insights they can give about American society. Recent episodes cover topics ranging from his first appearance on Twitter to the decline of white, Christian America. If you’re a policy junky who just can’t deal with CNN anymore, then listen to Politically Re-Active with W. Kamau Bell and Hari Kondabolu. Mixing comedy with the hot-button topics of the moment, this pod is made for policy geeks who have had their fill of mainstream news. Learn how to “keep your cool while talking with your Trump-loving uncle” and hear fresh approaches to the toughest issues we face as a nation. This week: A conversation with author David Daley, who titled his recent book “Ratf**ked: The True Story Behind the Secret Plan to Steal America’s Democracy.” It’s basically the topic everyone skims through in their high school government class without giving it the attention it deserves. Hosts and guest discuss the outsized impact gerrymandering has had on politics and how it ultimately “ratf**cked” America. Democrats may have won the election in 2012, but they lost America. If lines aren’t redrawn, disproportionate and inadequate representation in government will persist because gerrymandering eliminates competitive general elections. This is a fascinating, not-to-be-missed conversation, but we would have loved some focus on solutions. We were left without an action to take to make a damned bit of difference. If you have always wondered what happens when Hillary Clinton’s alarm goes off in the morning, listen to With Her. Hillary Clinton has not appeared at a press conference since December of last year, to the mass media’s significant chagrin. And yet this week, a podcast all about Hillary and hosted by podcaster and Hillary-ite Max Linsky made its way into our lives. Let’s be clear: This isn’t news, it’s campaign advertising for the podcasting age. But for staunch Hillary fans who want to know more about our first female Presidential nominee for a major party you are in LUCK. In episode one, which aired last Friday, she speaks to how she manages to balance her chaotic campaign life. She also touches on some other questions we’ve all been dying to ask: What time does she set her alarm? What is she planning on eating for dinner? Stay tuned for more from With Her. If your idea of “light reading” is The Economist, then listen to The Weeds. The Weeds, as its name suggests, delves into seemingly meaningless and sometimes insignificant issues and shows not only how even the smallest of actions can create an enormous impact, but the place these small events have in the context of the great big world today. This week, the discussion around Hillary Clinton’s transition team did just that, explaining how a team of people (whose only task is to select other people for jobs in the case that Hillary wins the election) impacts potential policy platforms, the tone of her would-be Presidency, and what messages her campaign might be trying to send. Although this episode was very entertaining, it could have done more to be accessible to the masses. While the pod has a pretty short learning curve, some prior knowledge of the policy issue of the moment is needed for full enjoyment. This week, we would have preferred the conversation to go into more depth on some of the details. If you are interested in every detail in every thing in the world, The Weeds is for you. It’s a podcast for those that love to get under the surface and understand the detail of some of the world’s most important events. If you are interested in adult things like paying your bills on time and afternoon tea then listen to The Diane Rehm Show. If all these podcasts were members of the British Royal family, The Diane Rehm Show would be Queen Elizabeth — traditional, structured, distinguished, and looks great in a yellow hat. Serving up twice-a-day hour-long episodes, it is a big ol’ time commitment to stay on top of every moment, but we do recommend their Friday News Roundups. One International hour and one Domestic hour see Diane (or a guest host) moderate a panel of established journalists in analysis of the week’s events. They do a great job of telling the story before they discuss it, so it’s easy entry-level listening that will make you feel like an expert. If you felt guilty for not listening to NPR enough this week, this is the podcast for you. We are constantly expanding our library of podcast choices. What else should we be listening to? This week’s Political Podcast Review was contributed to by Catherine Alonzo, Paloma Ibañez, Duncan Maloney and Michelle Thomas.